Pioneers in catering specifically to the needs of families with children, the folks at Club Med were kid-friendly long before being kid-friendly was cool. The GOs (“gracious organizers”) who play host to Club Med guests are genuinely that, welcoming and warm. 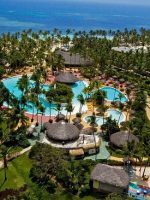 So when their Punta Cana resort recently underwent a $36 million renovation, which included adding some impressive and high-end waterfront family suites to the property, the renovations did not disappointed. 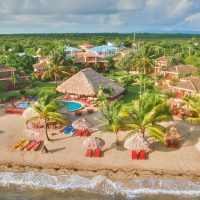 Located on the Atlantic coast of the Domincan Republic, on a private stretch of white beach just 10 minutes from the Punta Cana airport, the resort is ideal for folks who don’t want to venture too far afield; but are looking for a peaceful, tropical respite. The Club rooms offer two bedrooms, a living area, mini-fridge, flat-screen TVs, AC and bathrobes. 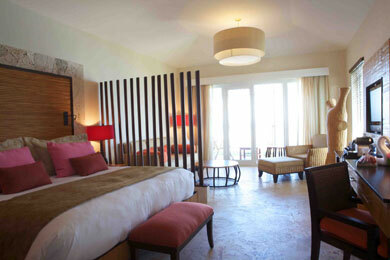 Deluxe rooms are ideal for families of three to five people. There is one bedroom and a sitting area or children's bedroom area separated by a curtain. While the Club and Deluxe rooms are more than adequate, and located in tasteful, brightly-colored low-rise buildings facing the ocean, it's the Family Suites that you'll write home about. Because Club Med's rates are comparatively affordable, it's well worth the extra splurge for these waterfront suites. With 750 square feet of space, you'll get two bedrooms with high-end decor and amenities, two gorgeous and spacious bathrooms (our master bath had a large bathtub and two separate sinks, and even the kids' bathroom looked like a spa ) as well as a large sitting area and a private terrace. You'll also get a mini-fridge, coffee maker and an in-room computer with free Internet access. When staying in a family suite, you'll also get shuttled to the resort from the airport, and to your room from a separate check-in area at the resort, as well as access to a private (communal) infinity pool and concierge. We bought a daypass for today april 19th. The hotel looked great, the food and activities were very good as well, we had a great time with my kids and friends. My only concearn was at check in, the person who checked us in was a bit rude (Valeria), first she told us that if we stayed 5 minutes after 6pm we would have to pay for a night pass even if we did not use it (i dont see why that was necessary...a simple its up until 6pm was good for us), then we asked her where the bathrooms were and she started speaking in french (we dont speak french) and then told us where they were. Last she gave us the maps and the activities in french saying she was sorry but we will need to understand it anyway we can. That was our only off moment...all other staff were very polite. 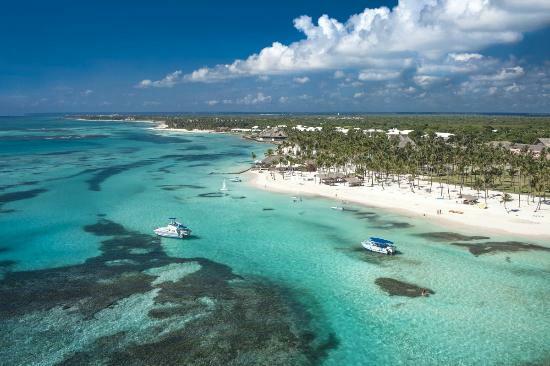 Punta Cana is known for its beautiful, calm beaches, ideal for swimming; and Club Med's beach is no exception. 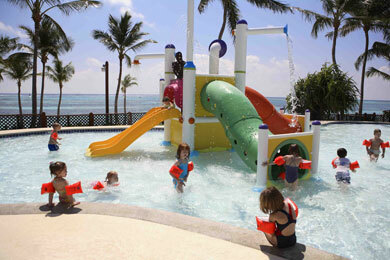 It is large, private, and has a gentle slope with clear, shallow water where kids can dip their toes, windsurf or sail. 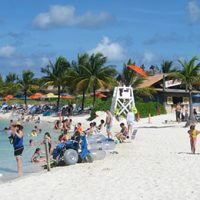 The beach has plenty of lounge chairs, as well a bar with outdoor seating and light fare like wraps and salads' great for snacks or a quick lunch if you don't want to head up to the main dining rooms. 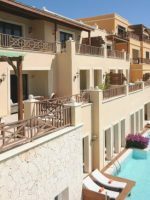 The property has three swimming pools, including one dedicated to the children's clubs, which has a small water park area with slides and sprayers. Outdoor activities at the resort abound; you'll find basketball, beach volleyball, bocce ball, football, tennis, kayaking, water polo, snorkeling, scuba, and sailing, among others. There are beginning group lessons in sailing and windsurfing, as well as group lessons at all levels for aqua aerobics, archery and tennis. There is also a weight room, and a super-cool skating ramp for kids ages 11 and older. 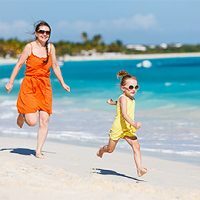 Club Med Punta Cana offers supervised kids' clubs for children ages 4 months to 17 years, including the Baby Club (4 to 23 months), Petit Club (2 to 3 years) Mini Club (4 to 10 years) and Passworld (11 to 17 years). While the Mini and Passworld clubs are complimentary, the Baby and Petit clubs are available for an additional cost, and are not included in the all-inclusive rate. The kids' clubs are absolutely top-notch. The G.O.s are warm, competent, fun, and always wear a smile. As a parent, you can come and go as you please; they welcome you to pop in and visit. 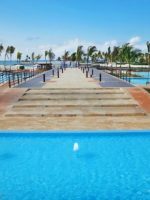 Kids may go to the beach to take part in various water sports, attend tennis clinics, swim in the kids' pool and use the waterslide, hike the property, visit the flying trapeze and do art and crafts. Teens can hang out at a village called "The Lab at the Ramp" where they take part in fun activities including dance lessons, video editing, mixing, and theatre lessons. 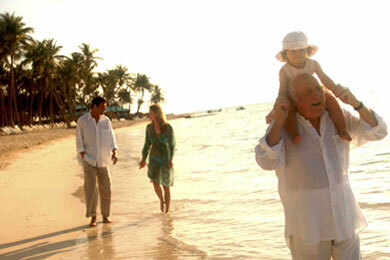 A large percentage of Club Med G.O.s and guests are French. While a vast majority of them also speak English, this is not always the case for the children. Don't be surprised if your child is put into a group when French is spoken along with English, and be sure to discuss this with your child beforehand. Most children love the learning of a few new words and will not have trouble communicating with anyone. For parents of children ages 4 and up, there is a weekly stage show, which they prepare for during their time in the kids' club. The kids love performing in the small outdoor theater with their new friends -- and they put on a great show! Club Med has teamed up with Cirque du Soleil to offers kids (and grownups) trapeze lessons, as well as lessons on how to juggle, tightrope walk, and even unicycle. The instructors are patient and encouraging. Windsurfing, tennis, sailing and archery are just a few of the other sports and skills schools offered to guests. The huge playground is a treat for young kids and parents with little ones will enjoy the Baby Gym and classes. Six days a week, you and your baby (beginning at four months old) or toddler can take part in classes that allow them to climb, crawl, slide, and interact with other babies in fun, bright environment. With an emphasis on development of social skills, this program is geared towards exploration of movement. Let's face it, all-inclusive resorts aren't exactly famous for their gourmet dining. But the food at this property is solidly good, and often creative. Club Med Punta Cana has three restaurants and two bars. High chairs are available. 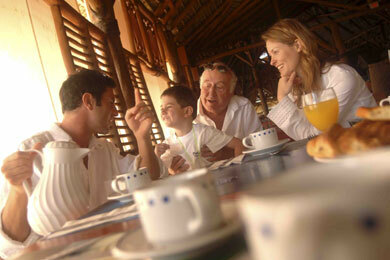 The Samana restaurant faces the swimming pool and serves breakfast, lunch and dinner buffet-style. Dinner offered a wide variety of fish, meat and pasta entrees, along with an unexpected selection of Asian-style spring rolls, which were quite good. The desserts were decadent. A special baby corner is available for parents to prepare meals for little ones right in the restaurant. Hispaniola serves buffet breakfast and lunch and dinner and has gorgeous views of the sea. Breakfast offers a great selection of breads and pastries, as well as cooked-to-order omelettes and fresh fruit. The newly renovated Indigo Beach Lounge features a beautiful waterfront view and is a restaurant, lounge and bar that transforms through the day. Late breakfast, light lunch and beachside snacks are available here much of the day. Dinner is for adults only and then in the evenings the space becomes a nightclub, also for the adults. Room service is available in the family suites; while the food was good, the service was a little unorganized (orders went through the concierge office) at the time of our visit. Don't forget bug spray and sunblock! The onsite store is expensive. Also take along a windbreaker. Cool evenings and afternoon showers will make you glad you did. If you have a little extra space in your luggage, bring along some pens, pencils, paints, paper, school bags or toys. The resort's "Espace Fondation" will see they are donated to local children in need. Babysitting can be arranged until 1 a.m. The Baby Club Med Welcome Program for children up to 23 months provides cribs, baby baths, bottle warmers, baby food and utensils. Complimentary Wi-Fi is included in the rate. Your best bet for a good rate is after mid-April when the low season fares start to kick in. 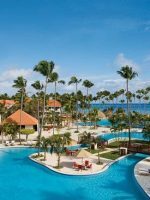 Club Med Punta Cana is located on the Atlantic coast of the Dominican Republic and just 10 minutes from the Punta Cana airport. When staying in a family suite, the hotel will provide a shuttle to the resort from the airport, and to your room from a separate check-in area at the resort. Don't miss the Wellness Centre, a secluded spa oasis on the far edge of the beach, away from the pitter patter of little feet. There is a variety of nightly entertainment for mom and dad.